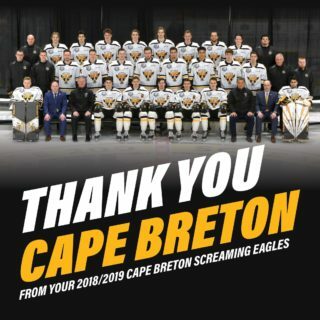 The Cape Breton Screaming Eagles finished their four game home stand with a complete 60 minutes in a 4-1 victory over the Chicoutimi Saguenéens. The Sags outshot the Eagles in the opening period but it was the home team leaving the first stanza with the lead. Olivier Bourret would begin the scoring at the 8:06 mark for the Eagles, with his first of two goals on the evening. In the final three minutes of the period, the Cape Breton lead would double. A Gabriel Villeneuve clearing attempt would not leave the zone as it was intercepted by Mathias Laferrière, who wired it past Alexis Shank to double the margin. 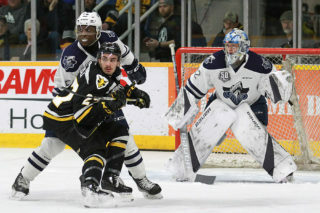 In the second period Chicoutimi would get on the board past the eight minute mark, as Zachary Lavigne snapped a shot through traffic that got past Kevin Mandolese. However within four minutes the Eagles would re-establish their two goal advantage when Brooklyn Kalmikov sped up the left wing and blasted a shot over Shank to make it a 3-1 game. The Eagles penalty kill would have a successful night that didn’t feature much special teams play on either side. Cape Breton would only earn a power play in the final two minutes of the game, and Chicoutimi had three power plays but were limited in their opportunities. 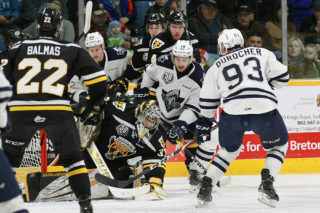 Their best chance came just after a power play had finished late in the second period, as with the puck having not left the Eagles zone Jérémy Diotte saw his shot saved on by Mandolese. Christophe Farmer had the rebound on his stick for what it seemed like a sure goal but Mandolese made tremendous stick save to keep the score at 3-1. Chicoutimi would not get any better chances to tie the game, as they were held to three shots in the third period. With under four minutes left Yanick Jean would lift Shank for an extra attacker but couldn’t get the score any closer. Not long after the goaltender was pulled, Leon Gawanke would fire the puck the length of the ice, hitting the post in an attempt to snag an empty net goal. The puck lied in the crease and Bourret came down the ice to tap it in for the insurance marker. Mandolese picked up the win, stopping 21 of 22 shots. Shank took the loss, stopping 24 of 27 shots in addition to the empty netter. 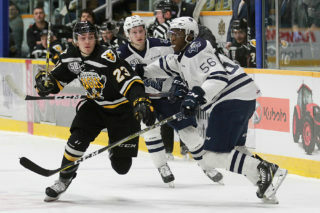 The Screaming Eagles will now head to Halifax to take on the Mooseheads on Friday night. Puck drop is at 7 PM, and you can catch all the action beginning with the pre-game show with Patrick McNeil at 6:30 on 1270 AM CJCB or online at www.cjcbradio.com.